sunhawk wrote: Hair length is status in this culture. So why is Diva's hair still slave short? Is she still playing the roll of servant to her daughter sil'lice? Mel is Snad'hyarune's prized trophy wife. She would never have her tainted or used as an errand minion. Diva is also still a child for an elf. Physically younger than Ariel and Kiel. Doom Chinchilla wrote: Why has that infiltrator not killed somebody who can raise an alarm, has obviously been caught off guard and can't defend herself? Raise an alarm to whom? Doom Chinchilla wrote: Also, Diva, I'm disappointed on you... such slow reflexes and utter lack of caution! It comes with the class, that and she dumped all stats but Int. Junglefowl26 wrote: The baby is a barbarian, probably has better con scores than a wizard like Diva. Hah! Even with her size adjustment, the baby has more Str too. HidingGoblin wrote: She's awfully young to start rolling classes, isn't she? Nah, barbarians don't get literacy. Black Knight LeFreux wrote: Maybe the first assassin is rushing to the objective while the second one is coming up to Diva to silence her, or keep her occupied if she's tougher than she looks. The second one stays at the elevator controls. James Rye wrote: How strong is that baby that it can beat the former empress? SzordrinZaphresz wrote: Assassin ignores the "servant" Diva? That's a first. Nah... Most slave-based societies would consider a domestic servant no differently than you or I see a vacuum cleaner. Killing an appliance would be pretty silly when time is of the essence. Also, blood is slippery, and the entrance may also be the exit. Awww Baby turtle is SO cute ! And Diva seems to remarkably play the grumpy-loving grandmother. I don't know who nor why the "visitors" are here, but it's a good thing they did not harm neither of them. Mel? I'd be surprised. And why do a fast run-by after a rather complicated diversion while you can shift into shadows and sneak your way in? Diva raises a girl. The girl turns against her and casts her down on the floor, crowing triumphantly. Eh, what can you expect from the librarian-formerly-in-charge. Though that pose implies she wouldn't win against a cat demanding bellyrubs. The background even says they are in the library. Pain to draw. Alas I do not recognize any of the titles. The short hair may be habit, a ploy to make others underestimate her (has she told Sil yet), or an admission of being weaker than she used to be. I wonder if the widening eyes is due the sad mask lady stabbing her. The previous owner of those robes did make that expression. Once. In any case, this chapter sure has faster pacing than the chapter before. Going to be 40-50 pages by the look of it. sunhawk wrote: Diva is also still a child for an elf. Physically younger than Ariel and Kiel. Eeh...Kiel maybe. Not Ariel, though; Ariel was something like 1 when Diva'trika ate/possessed/took over Ragini in Longest Wait. I don't think that Diva'trika was ever physically imposing, nowhere near as much as Sarv'swati at least. Her hairstyle was likely compensating for such lacking. As for the new Diva, her body was subject to chronic malnutrition as Blueberry. Diva all growed up?? No wai! 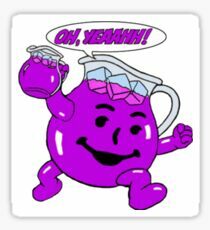 I always thought she would grow up to be a purple version of the kool-aid guy. OH YEAH!!! They'll be like: "How can something so big be so stealthy!?" Because Laeledemon is bound to move like an assassin despite her added limbs and mass. Whizzard wrote: They'll be like: "How can something so big be so stealthy!?" Tsac'Tuo wrote: What i want to know is. Did Diva stole Snad or Sha'sana clothes?